This is another cozy mystery series. I liked the character Annie who returns to her hometown to get away from the trouble her ex-boyfriend is in. She is afraid she will end up right in the middle of it. She receives a message that her aunt’s cafe burned down and that is when she decides to head home. She has been estranged from her parents, so she goes right to her aunt. They reopen a new cafe in a new building. The first morning Annie arrives she finds her ex dead in a booth. Many more strange things happen to Annie and her aunt. It’s a fun easy read with a few surprises. This is the first book I have read from Becki Willis. It’s a romantic mystery that keeps you guessing until the end. The romantic scenes were definitely R rated, but done tastefully. Ashli is being stalked and the police don’t take her seriously so she hires a private detective to protect her. Of course Lange is drop dead gorgeous and she is the most beautiful woman he’s ever seen. Ashli, however doesn’t realize her beauty, inside or out is anything special. There is more going on than trying to catch the stalker. Lange has no family and feels like he has no roots. He slowly opens himself up to the possibility of new love complete with family and a home. I really liked the book. However, I am noticing that many of these kindle edition of books have many mistakes in them. I am not sure if they are not edited well, or if there is some problem in creating the ebooks. Speaking of quilting. I am getting ready to make a quilt for my grandson Andrew. He has Aspberger’s and he is a sweet heart. 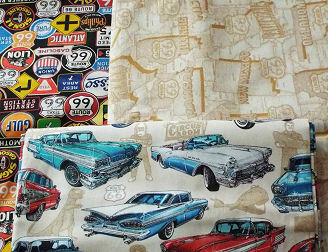 He loves logos and signs and he has always loved Route 66 and old cars. So I found the best fabric. It’s called “Get Your Kicks” by RJR Fabrics. It came out in 2012 so I was really lucky to find it. Actually, my husband found it for me on Ebay. Isn’t this great? It has all the road signs along Route 66, the map and the old cars. I plan to make the Turning Twenty pattern for Andrew. I think it should look great in these fabrics. I have to find fabric for Aidan’s quilt. Aidan is my second grandson and he is such a love bug. He wants to have sea creatures. But he doesn’t want the comical ones. Of course my grandchildren always want a theme that is no longer popular. I am not having much luck with fabric for Aidan. I may have to talk to him about using another theme. He loves animals, so maybe he’ll find something else he would like. Alannah is my first granddaughter and the boys little sister. She is a dancer and can’t get enough of it. She does ballet, clogging, tap, jazz, and lyrical. She’s at the studio every day during the week. She started competing when she was 5. She will be 8 on July 1st. I had picked up fabric with ballerina’s on it for her quilt, but I think it might be too young for her now. So I will have to talk to her and see what she prefers. She loves clothes and shoes and purses. She takes after her mom, aunt and grandmother. 🙂 So I guess none of us can complain.